FARMERS MARKETS EVERY THURSDAY FROM 10AM – 2PM VOTED ONE OF IRELAND TOP TEN FARMERS MARKETS IN IMAGE MAGAZINE. Our farmers markets provide a direct contact between customers and producers, so you can be sure how your vegetables are grown and meat produced. 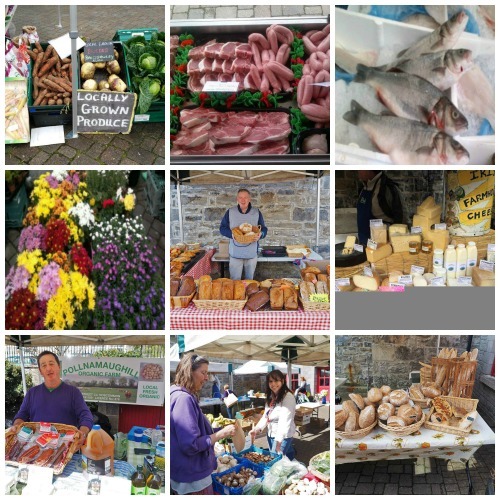 Market Stalls include fresh fish, organic meat, bread, eggs, fruit and veg. You can also buy a large range of cheeses, organic wine and lots more. A flourishing Farmers Market is fantastic news for local people. As consumers it means we have access to a range of food that is fresh, seasonal and delicious. We can talk to the very people who grow, rear, make or source the food. Our farmers markets every Thursday provide a direct contact between customers and producers, so you can be sure how your vegetables are grown and meat produced. Reggies Veggies – seasonal organic vegetables, salads herbs and fruit crops grown on their farm. Gerry Blain – ‘The Donegal Fisherman’- continues to provide an amazing variety of fresh fish. Frank Pasquier – ‘The French baker’- Full selection of fresh French bread, croissants etc. Trevor Irvine – Cheese Etc. Great selection of cheeses, olives and dips. Declan, Irish Organic Meats – Top Quality selection of Beef, Lamb and Chicken. Breege Tiernan – Her own free range eggs and organic olive oils. Tulsk Fruits – Fresh Organic Strawberries. Sean Gormley – Great range of flowers and plants available The Bread Island – Great selection of hand crafted sourdough bread and rolls using only flour, water, salt & wild yeast. No artificial additives.